A few months ago the MayDay Rooms Archive received a new deposit of 9 boxes of materials from various eco-anarchist struggles in the 1990s and early 2000s. 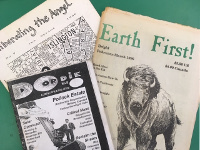 The collection comprises American and British Earth First magazines and newsletters, as well as runs of other radical environmental and anarchist publications, including Anarchy magazine, Green Anarchist, Black Clad Messenger, Subversion, alongside many other occasional publications and pieces of ephemera. The collection documents actions from around the world that were influenced by the proliferation of eco-anarchist ideas, from the inspiration drawn from the Zapatistas in Chiapas, through to the anti-roads movement in the UK, and European summit-hopping at the turn of the millennium. Join us for another social to eat and drink collectively. This month the social will be organised by one of our Building Collective residents. Keep an eye on our online calendar for more info. MayDay Radio is a new group that joined our Building Collective recently. 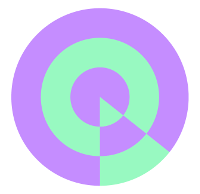 It is an experiment in oral histories and sound production; it is a place to share equipment and skills; it is a platform to create new oral histories and activate existing archives, those at the MayDay Rooms but also beyond. Join us for its launch! You can find more info here. Come join us for an evening of scanning, Raspberry Pi libraries and lots of pamphlets from Statewatch’s magnificent archive of subversive material. From the collection will be particularly focusing on publications from the Time Out Workers Strike in 1980. Come and find out about the radical history of Time Out before it became rubbish! Please bring a laptop if you have one, but still come if you don’t! On Friday 18 February 1977 John Berry ex-a soldier who had worked for SIGINT in Cyprus met two journalists from Time Out magazine at his home – Crispin Aubrey and Duncan Campbell. When Crispin and Duncan left the flat all three were arrested by the Special Branch under the Official Secrets Act. The Special Branch had placed under surveillance the National Council of Civil Liberties (NCCCL, now Liberty) – after they got a letter from John Berry – and Time Out magazine newsroom. This seminal case eventually led to the reform Section 2 of the Act. Their trial lasted for nearly two years. The defendants and supporters were regularly followed by the Special Branch, those demonstrating were photographed and the car of the Treasurer of the Agee-Hosenball Defence Campaign was broken into twice. It is hoped the event will stimulate researchers and activists to visit the Archive in order that the lessons of the ABC case and can inform present struggles for openness and against official secrecy. To celebrate the publication of their recent book The Counsel of Spent by Bookworks, members of Inventory we will hold a night of discussion about their work. The evening will also be a chance to view archival materials from Inventory’s past creations held at MDR, including issues of the journal that ran between 1995 and 2005, and other collectively produced objects and ephemera. The event is organised in collaboration with Bookworks. On Saturday 30th March we will spend the afternoon collectively unpacking the boxes, reading and discussing the material together. It will be an opportunity for people who know little of this history to get to know it, and for people who were involved to help explain some of what happened. We will be sorting the material ready for cataloguing, collectively charting some of the struggles it discusses, reading together, annotating, arguing and reminiscing, and generally to get digging through the archive to see what we find. Everyone welcome! All events are free and open to all and usually there is no need to book, unless mentioned otherwise.